I know that Hinterland is hard at work on new regions for Wintermute and polishing up existing regions. But eventually newer regions to Survival Mode will become a thing again. 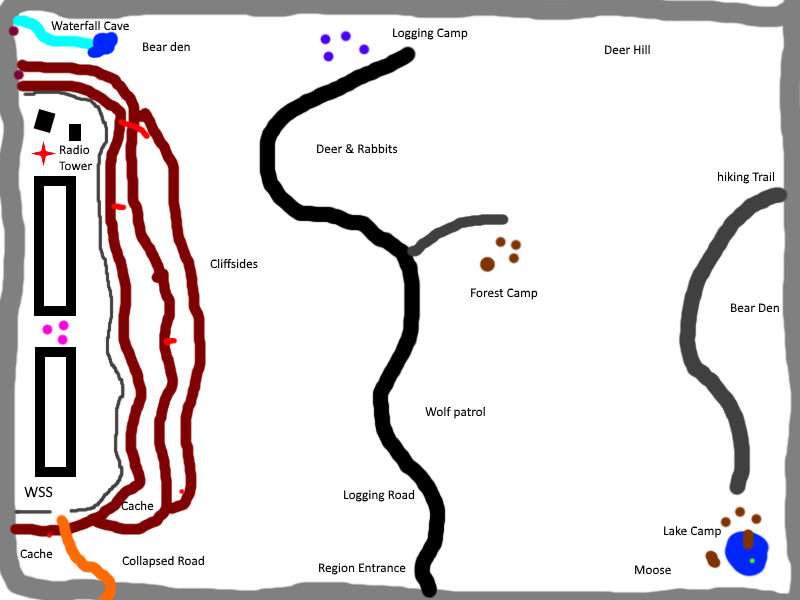 A good idea I had for one of these regions is called "Deep Woods" This region will be a mix of Mystery Lake, Pleasant Valley and Forlorn Muskeg. Essentially it would be a vast open forested area. Not too mountaineous terrain, a lot of trees, little water bodies, surrounded by high mountaineous rock walls. It borrows the vast openness and forested areas of Forlorn Muskeg and Pleasant Valley and mixes it with the feel of Mystery Lake. It would be a square region surrounded by high mountaineous rock walls but are surrounded by high snowbanks so they aren't too jarring and don't even appear at all. The entrance to this region would be in the center in the south. A small logging road that connects all the locations will spill out across the region from this point. The roads will be snow covered and won't be high on the edges. The Forest makes up nearly the rest of the region. It will be densely packed together (but with enough room to walk through ). It surrounds the roads and the trees go high allowing for little room to see any further locations. (along with snowfall this will be a tough challenge). Kinda like Lonely Homestead in PV or the forests in the Ravine. Essentially there will be few key shelters around. With a few logging roads that connect all around the region. -A logging camp here and there, I was thinking of having two on opposite sides of the region. -It will also have a small hunting camp with cabins like ML but a lot burned down with a larger main cabin that can be burned down or not. Kinda like the size of the Camp Office but with the utility of the Post Office in Milton. This area would be very secluded. Connects with the logging road. Chance for a Rifle. Not much food. -Couple sheds around the sides of the region that act as small temporary shelters. Bedroll chance. -Up on the mountains in the west of the region there will be a sort of plateau area. Up on that plateau will be a Weather Service Station with a large building and a radar satellite and all that jazz. Kinda like Signal Hill but larger. To get up here you need to make your way around the woods until you find a set of ropes leading up. First you need to pass through a cave with a rope inside of it and then the rest of the ropes. This location will have a Flare Gun chance and a decent amount of food. (not like the Summit though) Exterior will be dangerous during the Aurora. It will also need an aurora to access it. -Normally there would be a road leading up to the WSS from the logging road, but heavy snowfall and seismic activity has caused it be inaccessible. Various tree and rock collapses will cover this road. The road is on the very side of the rock wall. Close to where you would enter the region in the most southern part on the logging road but it won't be directly connected due to the snowfall as mentioned above. So some exploring will need to be done. (but it's blocked so no point). -Loads of Deer and Rabbits but aren't near the various locations. You need to go looking in the forested areas (pretty much everywhere) to find them. -Wolves, hunt in packs through the forest and move locations (Stalker only). They usually hang out around the creek/pond and logging camp #1. -Moose around the small lake area. Blizzards occur often (but not PV kinda often) but don't last too long. Not too dangerous with all the trees, but at the service station it is. It's often snowing light. But when it's not it's partly cloudy or a clear day. Can be very foggy in the morning, but never at night. Can be overcast, temperature drops significantly. So what do you guys think of this? I think it's a really good idea. Because it pretty much forces you to do hunting which I don't think the game makes you do enough. It also has a relatively different scenery and atmosphere. Most shelters in the existing regions have big open spaces in front of them but here it's very reclusive. It's also got a unique weather pattern, no longer is there annoying fog but rather a lot of snowfall and cold temperatures to make it challenging in lower difficulties. And for once a region that isn't bombarding you with wolves. I still really like this idea (I don't know if I responded when you posted this before). It really sounds like a great challenge and a fun place to explore. I especially like the Weather Service Station and that it's a combo of PV ML and the Keg. The closeness of the environment give it a really different feel as well. Signal Hill is technically a weather service station, didn't think of that. But I was thinking of a larger building like the size of the upper dam. Right, that's what I was getting from your description. I'm hoping one of the upcoming regions is like this. Nice!Could you make a map of this region? Here is a crude map I quickly drew of the region. Obviously not to scale. The distance between locations (white space, forest) is a lot larger. Nice, but waterfall in the corner seems like a waste of effort. i would make his stream longer and it creates north border of map (with some rocks). Mabe connect it Lake via frozen water running throught woods. I like idea about bear and his caves i would connect it with rifle. Rifle also can spawn in cave, together with backpack. It gives immersion that poor hunter was eaten by bear. Roads should be also connected, two or three separate roads like this dont make a much sense. One regular road spreading into smaller roads and tourist line makes sense. I think it's a great idea but some things to consider about. This applies to Hinterland as well if they ever add it in, but how would the mechanic of an aurora activated door work? Will it forever be unlocked the first time you access it? If not, could you leave through the door when it's not an aurora? Which region would this connect to? My thought would be a region that has train tracks on it so the freshly cut logs would be easier to transport. And would any of the lakes/ponds have a fishing hut on it? Because we do see something as small as the Pensive Pond have a fishing hut on it. I was thinking you could only access the building on the top with the aurora and either pass to the second building via tunnel underneath or walk around during the day to avoid being fried by wires around the satellites (pink dots) on the outside. Once inside you can climb out by a window but not come back inside. So you aren't trapped in there. As for which region to connect to, perhaps near the ravine? Or north of broken railroad? In Mystery Lake notes it suggest there are hiking trails around, so maybe the hiking trail here can connect to Mystery Lake or the surrounding areas. South of FM or ML perhaps, the logging road and collapsed road could connect to the rest of the highway to the south. The lake with the cabins has a fishing hut, the green dot. I really like this idea but there could maybe be a few wolves near the weather station so it would be more dangerous to explore.